For the past few years, the mantra among hospital leaders has been to “redefine the H.” The phrase was coined by the American Hospital Association as its members looked to retool operations as more care shifted to outpatient settings and as fee-for-service pay has almost become a profanity. The AHA in September will launch its Center for Health Innovation, which will consolidate some units of the AHA under one umbrella and aims to spread best practices across the membership. AHA Board Chair Nancy Howell Agee has been a key driver behind the association's efforts to address innovation and transformation. 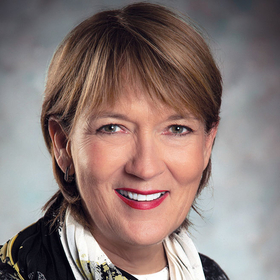 As CEO of Roanoke, Va.-based Carilion Clinic, Agee has a history of driving change. She led the system in its transition to a clinic model 10 years ago. She spoke with Modern Healthcare Managing Editor Matthew Weinstock during the AHA's Leadership Summit last month. The following is an edited transcript. MH: What's your assessment of how far along the industry is in moving toward greater value and innovation? Agee: Those are different questions. I think there's great variability in the field. It's not a lack of desire. It's as much as anything your payer sources, and they're very variable. If you're largely fee-for-service or you have mostly government payers or you are paid like a DRG, it changes your focus a bit. So I think we're moving along the curve considerably. We're beginning to learn from one another and that's part of why the AHA is creating the innovation center. MH: What are you hoping to achieve with the center? Agee: A lot of things. The burgeoning catalyst for change is multifactorial. It's affordability. It's value for care. It's changes in performance improvement, new technology, new science, new medications. It's a whole lot of things that are hitting the industry all at one time. What we're trying to do with the center, because we've been doing a lot of work in the affordability space, is pull that together internally for the AHA, but also look forward and be thought leaders for the field. How do we serve as a catalyst for change? How do we move things along? The center will provide education, provide an opportunity for best practices and serve as a catalyst. There also may be an opportunity for us to pilot things and serve as a lab, to reach out to more disparate partners and see what we can do together. Right now, it's a great concept that we're putting serious effort in. For an association, I think we're moving at lightning speed. We just thought about this really 18 months ago. MH: How will it differ from other efforts that have been underway? The Joint Commission, for instance, has had its Center for Transforming Healthcare for many years. Agee: A very significant difference is that we have nearly 5,000 hospitals that are part of the membership. We're looking for other partners. We're trying to not limit our thinking, and it's not focused on any particular aspect. The Joint Commission, for instance— and I was on the board—was more about very specific and tangible ways to improve care. Hand-washing is a great example. This is more about the delivery model itself. How do we really move the needle for value? MH: Is there a business gain for the AHA as well? Is it going to generate revenue at some point by selling consultancy services? Agee: It's not really intended as a revenue generator per se. Everybody's looking at how do we do things well, just like we're looking at our own health systems and hospitals. How do we pull the very precious resources that we have and not duplicate effort? We think the center is a way to create those synergies and add structure. MH: As you think about the move to value, the CMS in some ways has tapped the brakes on alternative payment models either through MIPS or bundled payments and is moving toward a voluntary approach. Are you concerned at all that, at least from a federal level, there's a dialing back? Agee: Sometimes we rely on the government to serve as a catalyst for change. They certainly can have a big hammer and make that happen. But more often, I think we know the work we need to do and the proverbial train's left the station. We're trying to figure out what the consumer wants. Frankly, I don't think the government has moved off of it. I think they're assessing and reassessing, which is a good thing. We may get stretched and pulled in different directions. When you take an at least 100-year-old industry and try to change it, there are many new delivery models that are possible. We need to take stock of what's working. Maybe doing it in a more thoughtful way than just push, push, push. MH: Where is Carilion as a health system? What level of commitment have you made to alternative payment models and how much of your patient population is at-risk? Agee: I'll just frame it by saying that we changed our delivery model about 10 years ago to a clinic. So before even the words “care management” became popular, we decided to change our model for our primary care practices. We've had 10 years of work there and have shown some really good success. We're constantly changing the model. What's important is how hard this is. You can't accomplish it in a day. We're all-in. Somebody will ask, “Where is that housed in your organization?” Well it's housed everywhere. It happens in primary care. It happens in the emergency room. It involves social services. It involves our nurses. We're really trying to have much more of an internal community and external community of services wrapped around the care delivery model. We are a CMS Next Generation ACO. We like that model, but we're not convinced that the requirements and the cost are worth it. The CMS has been delayed in giving us data that will help us make decisions about what we're doing. Whether we'll continue with that or not is a question we're thinking through right now. MH: What are some concerns with the CMS? MH: What about on the private payer side? Have you made inroads on risk contracts? Agee: Anthem has at least a 70% share of our commercial market, so they're the big kahuna. We've developed over the last five years, I think, a good relationship with Anthem, thinking of them as partners, not adversaries. Our Anthem contract is more of a DRG model. MH: Thinking about adversarial relationships, when an insurer like Anthem comes out with policies over ER coverage or imaging, how does that play into your relationship? Agee: Let's talk about them separately. For ER, patients don't show up in the ER with a diagnosis written across their forehead. I think clinicians need to make that decision, not insurers. For outpatient services, the pace of change is really the bigger issue. We want to do more on the outpatient side and we want to get paid fairly. I think both the insurer and provider want to move in that direction. They just want to move a lot faster than we can absorb right now. MH: I want to shift a little bit and talk about Medicaid expansion, which has happened in Virginia. You support it even though Carilion will be hit hard by the provider assessment. Why? Agee: Two reasons: One is patients who are insured get care earlier and have better health outcomes. So philosophically this is important. Financially, the provider assessment is less than what we believe will be reimbursed to us over time with Medicaid expansion. The first reason, though, is really important. We're very faithful to our mission in that regard. MH: It was such a battle for your state. Obviously last year's election had an impact, but also what else do you think swung the tide? Agee: Consumer opinion. The growing awareness that this is the wall. It's been hit several times. We were sending taxpayer money out of the state and was that fair? MH: A few years ago, you assessed physician burnout across the organization. It seemed fairly high with about 50% of physicians expressing they were showing symptoms. What are you doing now to try to address physician burnout given what we are hearing across the industry? Agee: Let me first just clarify that we've been doing a fair amount related to physician resilience for 10 years. We have a psychologist on staff just working with physicians. We have a leadership academy. We're doing a variety of things. We've been doing what we call engagement scores for a while. They were very high, especially with the physician group. But we decided to use a different tool to really understand it. We were surprised. Some of it's how you ask the question. If you ask me if I'm a little stressed, I might say yes, but that doesn't mean that's a bad thing. We've stepped up efforts in more targeted areas. Our GME program, our surgeons, our trauma program. We do Schwartz Rounds (from the Schwartz Center for Compassionate Healthcare). We have a psychologist who works with us. I just think there's a lot more awareness. For one of our physicians, his full-time job is to work with our medical staff. We're doing a lot more things in the area of wellness and not just for physicians but for all of our providers.